When dealing with the issue of a premature baby, many parents want to know the relationship between gestational age and preemie outcomes. Babies who are born before 22 weeks of age have a very low survival rate. For this reason, preemie outcomes are often analyzed based on gestational age. There are several points to consider when looking at the link between gestational age and preemie outcomes. For example, a full-term gestation can range from 38 to 42 weeks. This is based upon the date of conception. However, this date isn't exact. The estimate of a baby's gestational age can vary by as much as one or two weeks. A baby whose gestational age appears to be only 22 weeks may really have a gestational age of as little as 20 weeks or as much as 24 weeks. Doctors have discovered that they must consider other areas before determining the amount of treatment and the likelihood of saving a premature baby's life. This is why the gestational age of an infant should not be the only factor to consider when trying to determine a preemie's outcome. Babies born with higher birth weights have a better chance of survival. Babies born as a single birth, rather than a multiple birth, have a better chance of survival as well. Obviously, a baby born closer to 25 weeks rather than 22 weeks should have a better outcome. Babies whose mothers received regular prenatal care often had a higher success rate. Babies whose mothers were administered antenatal corticosteroids before given birth have a better chance of survival, as this will lower a baby's risk of respiratory problems. Premature babies who are female tend to have more positive outcomes. Every parent hopes and prays for a healthy birth and a healthy child, but there are sometimes circumstances which call for decisions regarding treatment. This is especially true for babies who are born very prematurely. Doctors often connect gestational age and preemie outcomes to determine the type and amount of treatment to administer. For babies born before 22 weeks of age, many hospitals provide only comfort care. This means that they will keep the baby as comfortable as possible, but will not perform extreme life-saving measures. Babies who are born after 22 weeks may be given intensive care, which could include placing a baby on a ventilator and performing other invasive treatment. 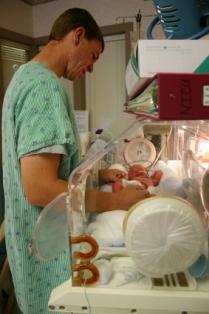 Babies born after 25 weeks are usually given the full-range of care. According to Waldemar Carlo, M.D., professor and director of the UAB Division of Neonatology, babies who are born weighing less than 2.2 pounds, comprise about 1 percent of all babies born in the United States annually. This figure equates to approximately 40,000 babies a year. In an article for Medical News Today, Carlo stated, "We knew that the closer a baby was to the 25th week, the better its chances. But, it often is hard to calculate a baby's gestational age. It's easy to miscount by a week, and that could make a large difference in the baby's chances of survival. We wanted to know other factors that play roles in survivability so that we can help new parents make decisions regarding the care of their premature infant." Because of this, it is important that physicians access as much information as possible before determining treatment for an infant. The NICHD Neonatal Research Network has made a program available in which parents and doctors can type in particular characteristics on an infant and receive statistics on survival and disability risks.